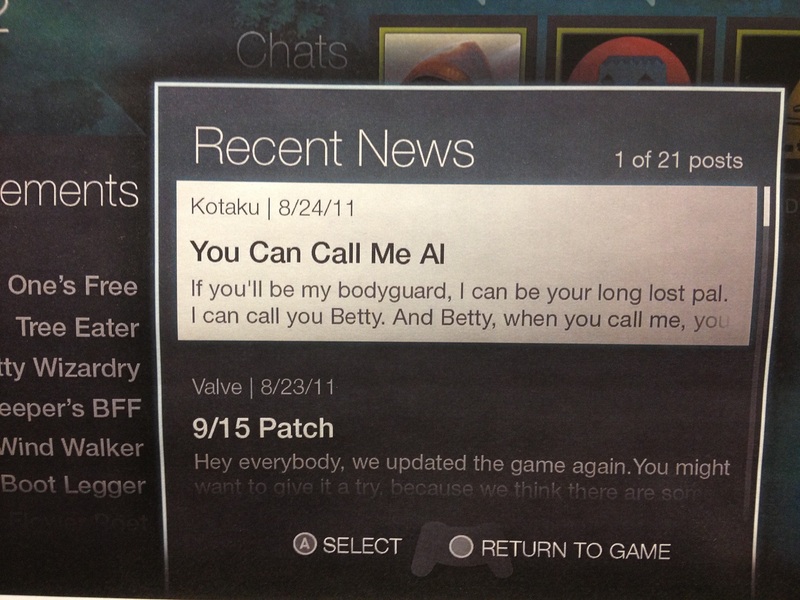 Today, Valve will launch the beta of Big Picture mode, a version of Steam designed for your television. That's right. The de facto central hub of PC gaming is now designed to run while you're lounging in your living room—and with a controller, no less. I've tried out Big Picture. It's sleek, intuitive, and groundbreaking in several ways. 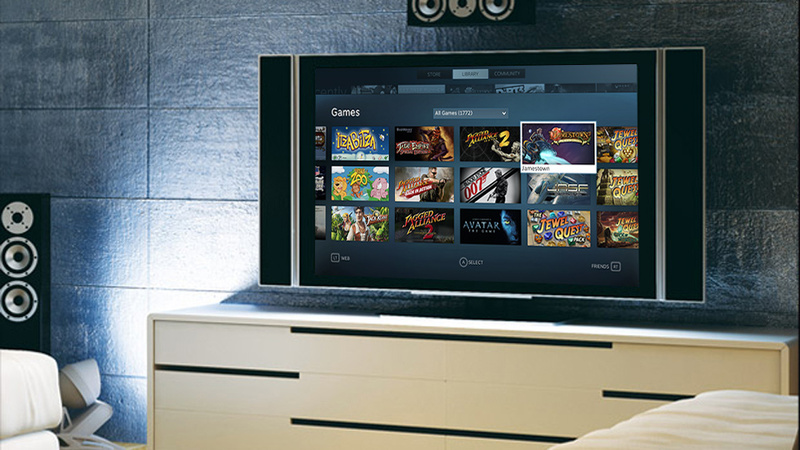 No, this new "Steam TV" isn't going to make our video game consoles go away. It's not going to turn your Xbox into a doorstop or obviate your PS3. But Big Picture could be a crucial first step toward making PC gaming more accessible, more convenient, and more suited for living rooms than ever before. Here are the basics: this afternoon, when Big Picture goes live, you'll be able to push a button and turn Steam into an entirely new interface. It sort of looks like the dashboard on an Xbox 360, minus the advertisements and other clutter that can make that system so irritating to navigate. And it allows you to do almost everything you can do on vanilla Steam: you can buy games, browse the web, and even chat with your friends using the platform's standard in-game overlay. The fonts, icons, and menus are all large enough to be comfortably viewed on a big-screen television, and the prompts are designed for a game controller. You can use Big Picture on your normal monitor with a mouse and keyboard, but that would defeat the purpose: this is an interface designed for your living room. Because the living room, Valve says, is where most people prefer playing video games. And maybe, just maybe, if fans seem to want it, and if it makes financial sense, the people who make Half-Life will use Big Picture to create their own version of a video game console. Valve isn't happy with today's gaming consoles. They made that quite clear to me as we sat in one of the back rooms of their Seattle office in late August, looking at Big Picture mode in action. See, the Xbox 360 and PlayStation 3 are walled gardens. You can't open them up or modify their insides. Developers can't release new updates or patches to their games without going through a restrictive, bureaucractic certification process. Nothing about these systems is open at all, and Valve doesn't like that. 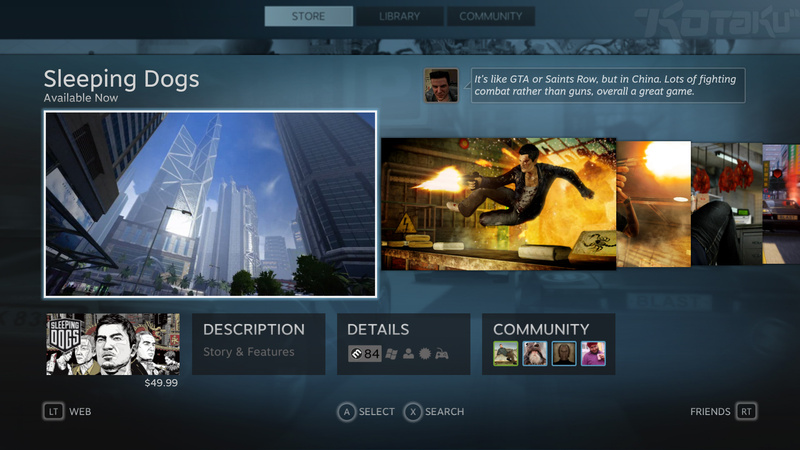 A Kotaku mock-up of what Steam's Big Picture could look like running on your television. Still, consoles have some advantages over computers. They're cheaper. More accessible. And you can play them on your sofa, feet propped up, a comfy controller in your hands. It's not so easy to do that with a computer. "We're confident in some things that customers want," Valve's Greg Coomer, head of the small team that designed and developed Big Picture mode, told me in his office. 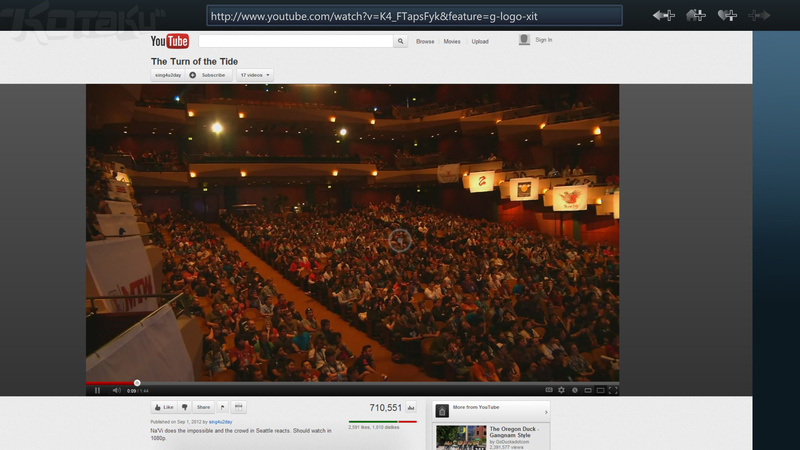 "They want a full-screen experience. They want to be in the living room. They want to use a game controller. They wanna have a social gaming experience. And we have this platform that lets us ship a significant portion of that experience." Valve: "If it's getting involved in shipping some kind of hardware, then we will get involved in doing that if we need to." 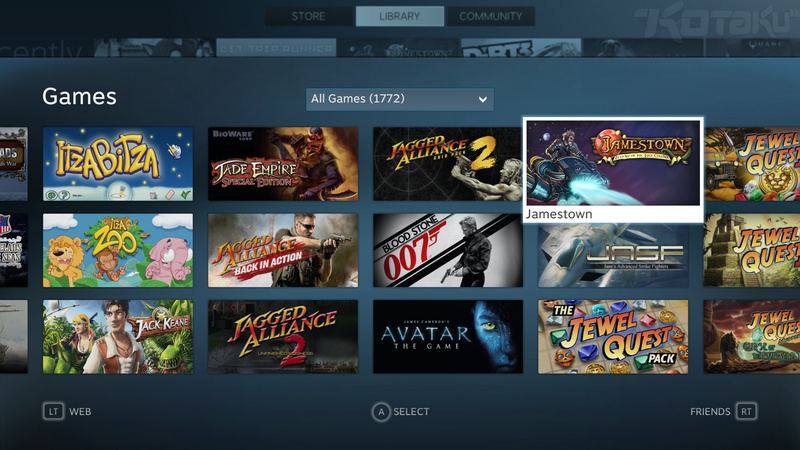 While Big Picture won't "connect all the dots," Coomer said, it will make it easier for gamers to play Valve's games—and the vast array of games that Valve supports on Steam—in the comfort of their living rooms. I ask the obvious question: is this the first step toward Valve making a console of their own? Maybe the Steam Box that has been rumored (and repeatedly shot down) for months now? "What we really want is to ship [Big Picture mode] and then learn," Coomer said. "So we want to find out what people value about that. How they make use of it. When they make use of it. Whether it's even a good idea for the broadest set of customers or not. And then decide what to do next. "So it could be that the thing that really makes sense is to build the box that you're describing. But we really don't have a road map. And we think we're going to learn a tremendous amount through this first release." 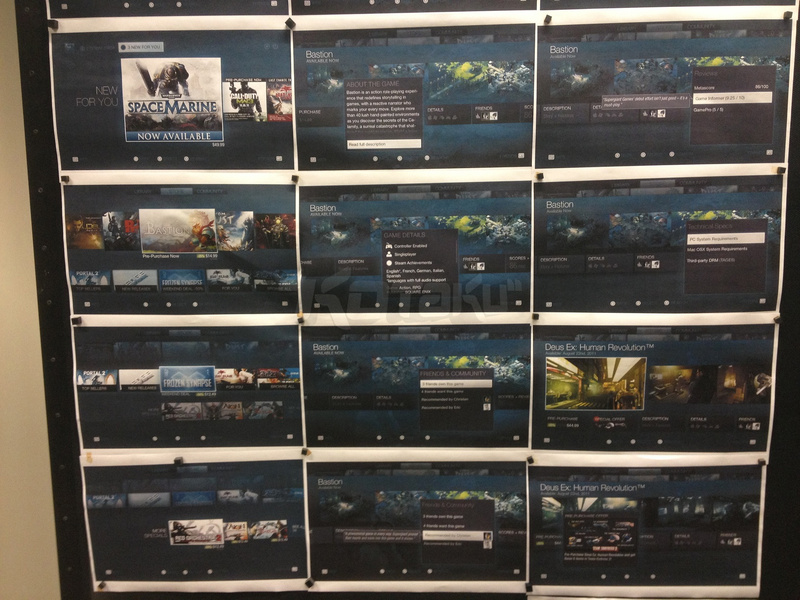 Seen at Valve HQ: Printed prototypes of Steam's Big Picture mode, including a Kotaku shout-out (complete with fake article text). No plans. But Steam's Big Picture mode is step #1 of an open-ended gameplan that could eventually lead to the company building—or stamping their name on—some sort of gaming console in the future. Or will fans ignore Big Picture entirely? "Each individual gamer is going to have to decide in the short term whether the value that Big Picture brings is something they want to configure for themselves," Coomer said. "And for some users it's going to be quite easy. For some users it might not be worth it yet. But that's one of the things we're going to find out when we ship. And then over time, I think we're going to figure out which of those scenarios, or what ways do customers really want us to get involved in solving the rest of the problems that, say, our software can't solve for them. "And if it's getting involved in shipping some kind of hardware, then we will get involved in doing that if we need to." What matters more is that Big Picture works as promised. And from what I've tried out so far, I don't think fans will be disappointed. In some ways, Big Picture is just like an Xbox 360's dashboard. In others, it's not. And the system's biggest feature is one that I imagine will be copied quite a bit over the next few years: a total redesign of the virtual keyboard. manipulate by dragging a cursor around the screen and selecting one letter or number at a time. 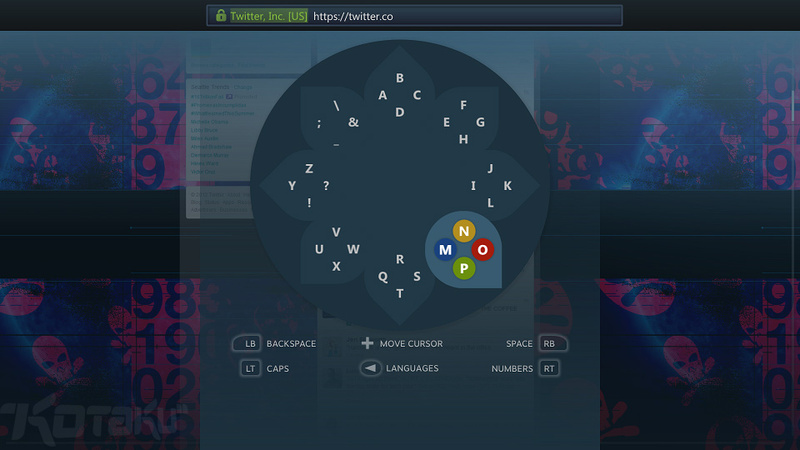 Steam Big Picture's keyboard looks more like a lotus flower (and you can see it in action right below this paragraph). In order to select keys, you move your left thumbstick in one of eight standard directions, then pick one of the buttons on the right side of your controller. When I looked at the mode, we were using a standard Xbox 360 controller, and each of the four colored buttons represented a different letter. So to press M, N, O, or P, for example, you just tilt the joystick diagonally right-down and hit the corresponding button. Already this gives you instant access to every character in a way that a virtual QWERTY keyboard can't. And the cool thing about this lotus is that it's not awful. In fact, it's actually kind of great. It's intuitive and quick. Seconds after picking up the controller and playing around with the interface, I was writing sentences at a solid, if not perfect pace. It can't quite match a physical keyboard, but it's better than any other virtual typing I've ever tried. A Valve team member proudly noted that when people have tested it out, "they're almost instantly faster than [when using] QWERTY." TWO SCREENS? Nintendo has their Wii U, Microsoft has Smart Glass, and Sony has Vita-PS3 cross-compatibility. I asked Valve's Greg Coomer if they, like all of those other big companies, feel like the future of gaming could lie in dual-screen play. "We are really interested in it but it hasn't been any of the focus in our work," he said. "Having a secondary experience, driving the primary experience, augmenting it with stuff that's social but ancillary—all those things are great, it's just not at the front of our priority list right now." Navigating the interface is also rather easy. You can use a controller's trigger buttons to zoom around your game library, shop for new games (and take advantage of Steam's frequent discounts and sales), and interact with your Steam friends. Fittingly, Big Picture's store will also highlight some of the games that are most suitable for your controller. You can even browse the internet, a function included, but not often used in today's gaming consoles. Coomer notes that the staff tried particularly hard to make a web browser that could actually be navigable with a controller, and they seem to have succeeded, although it's still not quite as pleasant as using a mouse. 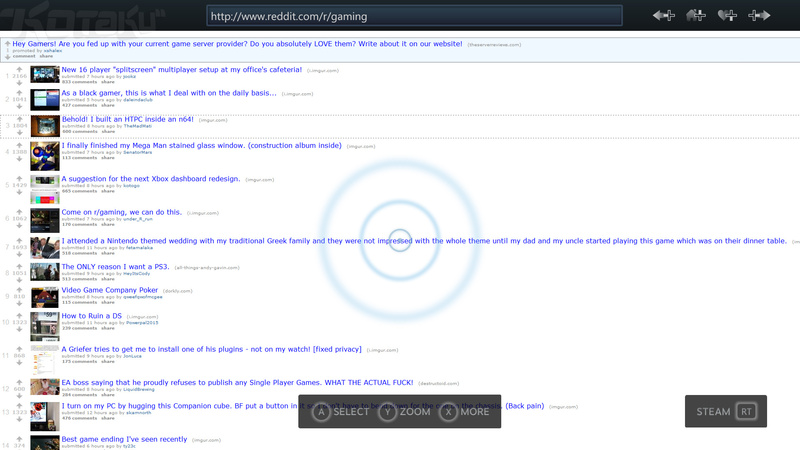 Like on normal Steam, you can even multi-task within Big Picture, switching back and forth between a game and your browser without minimizing to the desktop at all. Future plans for Big Picture mode include auto-correct, context awareness—"When you're in a web browser, it should know that you might want to put 'dot com' at the end of your address," Coomer said—and, in the distant future, some way to support cooperative split-screen mode, so multiple people can sit down in the same living room and simultaneously use their individual Steam accounts. As for hardware? Some sort of game-changing, earth-shattering, open-source Steam Box that combines the power and flexibility of a computer with the affordability and accessibility of a console? Let's not hold our breath. Valve still hasn't stopped running on Valve Time. But if Big Picture is the first step, it's a significant one. And after seeing Steam's TV mode in action, I'm tempted to go out and get a new desktop PC solely for my living room, just to play cheap, high-quality Steam games, to hook up and use alongside my Wii, Xbox, and PlayStation. Five years from now, though? Maybe Steam will be the only console we need. Republished with permission. Jason Schreier is a contributing editor at Kotaku.